Our smooth wheat beer is light in color and body…perfect for those looking for a lighter taste. The combination of wheat and barley gives Apricot Wheat a different malt character than our other ales. The hint of apricot gives this beer a pleasant nose and fruity finish. 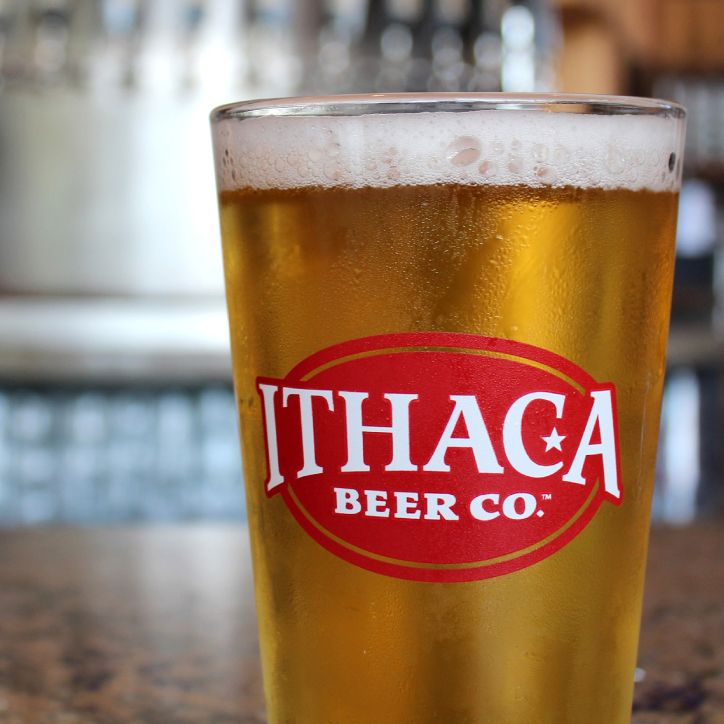 Brewed with 100% NYS Hops and 66% NYS Malts, Ithaca Beer Co.'s Brew York Pale Ale proudly supports New York agriculture. Featuring hops from Chimney Bluffs Hoppery in Wolcott, and Ledyard Farms in King Ferry. Local malts sourced from NYS Empire Malt in Champlain and 1886 Malt House in Fulton. Green Trail is a subtly hazy, easy-drinking India Pale Ale with bitter hop-forward intensity perfectly balanced by a smooth malt body. Enjoy the dank, grapefruit aroma, well-rounded mouthfeel, orange-gold color & creamy head on our finely crafted year-round beer. The name CascaZilla (Cas-kuh-zil-uh) is a play on both the name of the gorge in Ithaca called Cascadilla and the monster amount of Cascade Hops we use while dry hopping during the brewing process. The predominant flavor and aroma of this beer comes from fresh American hops. CascaZilla gets its distinctive red color from a subtle addition of black malt, which also lends a hearty body and slight sweetness. The rich mahogany hue of the Nut Brown is the first thing you will notice. You’ll find subtle hints of both chocolate & coffee. We delicately blend chocolate & caramel malts with four others to make this flavorful, easy drinking beer. The malt character will appeal to those looking for a moderate dark ale, but the smoothness is what will surprise all. Introducing Lakeside Lager, a refreshing and light Pilsner style lager with a perfect balance of flavor, mouthfeel and finish. Light golden in color, Lakeside Lager features a subtle sweetness and a restrained hop character that lends a gentle floral quality and clean finish. Competitively priced, Lakeside Lager is an easy drinking beer for an easy living lifestyle.